Note from Louise: I’m starting with Orson, since he’s the most well-known of the Lyonhurst Mastiffs, but please don't miss Orson's sister and grand-dam, whose stories of service to humanity are quite remarkable. Orson went through training for a movie being filmed here a few years back. He got replaced by a Great Dane after filming started, but learned to work around and cut through a flock of sheep. The woman helping me train told me that what he accomplished with her was the very final stages of training that is done with working Border Collies. These dogs are a lot more intelligent than most people think. I got a call 8 years ago from a couple with a handicapped teenaged son. The boy had a lot of things wrong. He was Autistic, with the mental maturity of a 7 year old, had been born without the tubes in his ears connected, and had stainless steel implants; so, he was very sensitive to loud noises. When we met them, he was recovering from surgery for testicular cancer. The boy’s therapist suggested they get a dog. He specifically suggested they get a Mastiff. 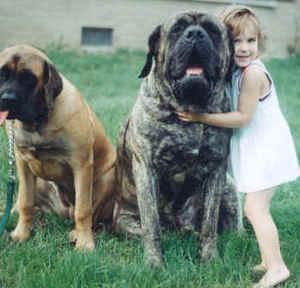 The boy was 18 years old and weighed 230 pounds, so the doctor told them that a Mastiff would not only be of the size to not get accidentally squashed by the boy, but also had the temperament to handle his mood swings and temper tantrums. I had great reservations about placing a puppy with this family. On the phone, the mother told me the last dog they had owned had been 20 years previous, and it was a little poodle. But they came to visit anyway, and we ended up spending 3 hours together. I learned they had a local friend who raised and showed Danes, and of course I was only a phone call away, so help was nearby, if they needed it. That was how Jean Luc became part of their family. The parents spoiled her terribly, but in a good way. The son was an avid Star Trek-Next Generation fan, and named her Jean Luc. The mother had miscarried a daughter at 7 months, shortly after their son was born, and it was as if she had another baby girl. Jean Luc adored the son, and was gentle and patient with him from the start. At some point, she started letting them know when the son was about to have a seizure! She would become agitated and run back and forth to wherever the mother was, until she came into the room with the son. Then Jean Luc laid her body down next to the boy, as if trying to cover him, until the seizure passed. It was purely instinctive on her part. This can't be trained for. Well, she was the first official Service Dog for the State of Illinois. They didn't have any requirements or official status for service dogs other then seeing eye, but the mother wrote to the Governor about their situation. The Governor's wife made up a special card for them to carry, and signed it herself, so Jean Luc was able to go with them everywhere. She went with them to restaurants, to the hospital when the son went in for tests, anywhere they went, she was with them. Orson's granddam was the first certified Search and Rescue Mastiff in the state of Kentucky, and she qualified at 10 months of age. Any older, and she would have been too big to be tested on their equipment. She was never called for duty, but I did get to see her go through the routine a few years later, and it was so exciting to watch!